A Testamentary gift does not cost now, but can help the world become a better place after you have gone away. You can choose to deposit an amount, an item or a percentage of the estate after all else has been settled. Grid for the front page. We created the content strategy and wire-frames based on conversations with the client. It was evident the importance of informing the user about the concept, while making it easy to contribute with a gift. 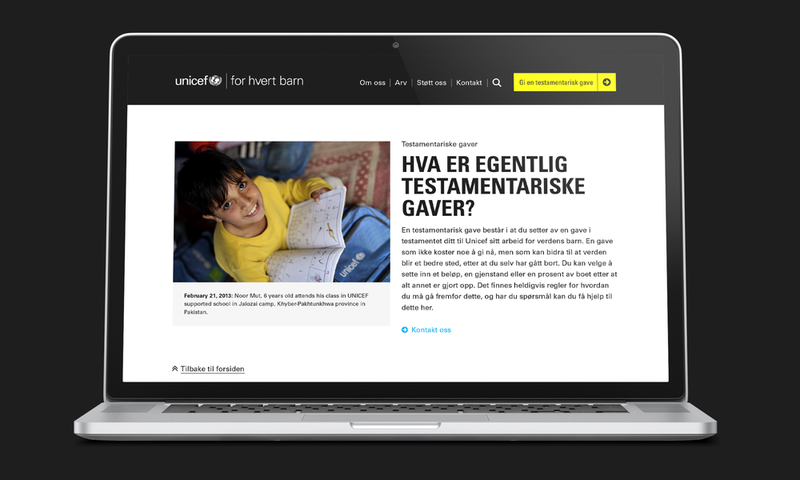 Based on the Unicef brand guidelines we created a simple and usable navigation experience for mobile and desktop. A yellow call-to-action-button was created to stand out and take the user to information about how they could contribute. The website was designed so the user easily could navigate and collect information. Frequently asked questions and the Rachels story video gives in-depth info about the concept of testamentary gifts. The yellow call-to-action button stands out and guides the user to contribute with a gift.